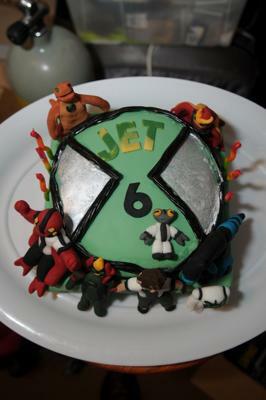 My son wanted a Ben 10 cake for his 6th birthday party so I made this Omnitrix cake with Ben 10 and some of his aliens standing around it. It was a basic chocolate layer cake coated with caramel (sweetened tinned condensed milk which has been boiled in the microwave until brown)and then covered with green colored peppermint flavoured fondant icing which is really easy to make. The characters were also made from colored fondant icing. I used cocktail sticks to hold the arms, legs and heads on and glued the various parts together with some of the relevant colored fondant mixed to a paste with hot water (sometimes referred to as sugar glue). Each alien had a tiny Omnitrix on its chest and the Ben character had the omnitrix on his wrist. The omnitrix was outlined with licorice and the triangles painted with edible silver paint (available from caked decorating shops). I rolled out some fondant for the lettering and used cookie cutter letters and numbers to cut them out.